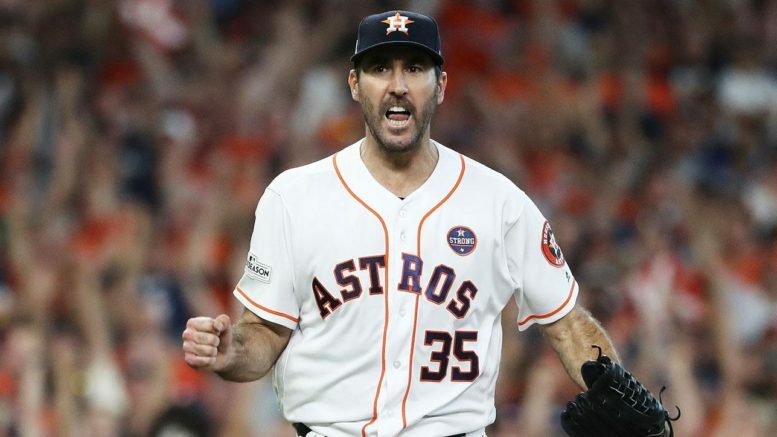 Justin Verlander will start Game 2 of the World Series after being named MVP of the ALCS. Verlander will be making his third career World Series appearance. Phew. That’s about all you can say after the Houston Astros did something no team has ever done (but a lot of people were waiting to see). After three teams — the 1998 Indians, 2007 Indians, and 2009 Angels — failed in their quest to take down baseball’s Evil Empires, the Red Sox and Yankees, the 2017 Astros dared to go where no one had gone before (and may never go again). #HoustonStrong, indeed. Unfortunately, despite their heroic efforts through the American League playoffs, the trophy has not yet been awarded to the ‘Stros. That’s because the Los Angeles Dodgers, they of 104 regular-season wins and a 7-1 postseason record, stand in their way. It’s a battle of old NL rivals that kicks off in Hollywood tomorrow night. The Astros are the highest scoring team in baseball. A lot of times, those lineups get shut down in the playoffs by superior pitching staffs. But consider that the Astros did, in fact, get shut down for five games against the red-hot Yankees — and still won. Consider that despite going 1-4 combined on the road through the first two rounds, the Astros won the pennant. If the Yankees bullpen couldn’t fully shut down Houston’s lineup, L.A.’s doesn’t figure to, either. Position-by-position, the Astros are mostly the better offense across the board. Jose Altuve vs. Logan Forsythe is the biggest mismatch, but even the Dodgers’ top lineup threats aren’t all that much better than their counterparts. Carlos Correa gets the nod over Corey Seager, even though Justin Turner has the edge over Alex Bregman. Yasiel Puig over Josh Reddick is probably L.A.’s biggest mismatch, even more so than Cody Bellinger vs. Yuli Gurriel. Brian McCann broke through with clutch hits in Games 6 and 7 and could be an X-factor. Edge: Astros. Gotta go with the Astros here, even though the Dodgers have Clayton Kershaw. The lethal 1-2 punch of Dallas Keuchel and Justin Verlander is reminiscent of Randy Johnson and Curt Schilling, and Lance McCullers was an All-Star who looked up to par in Game 7. Charlie Morton vs. Alex Wood is a toss-up, but Morton was stellar in Game 7, while Wood struggled in Game 4. Edge: Astros. This one isn’t even close. Then again, we said the same thing in each of the last two series the Astros played in, and Houston won both. Kenley Jansen is hands-down the best closer in the National League and is ready to pitch multiple innings in a game if needed. Ken Giles has proven to be very untrustworthy, having surrendered at least one run in four of his five postseason appearances. Brandon Morrow has been a revelation as a dominant set-up man, something the Astros don’t really have anywhere in their weak ‘pen. But as he did in Game 7, A.J. Hinch could find solace using a starter from the regular season to supplement the bullpen, especially later in the series. Collin McHugh is a name to keep an eye on, as he pitched four hitless innings in Game 3. But with Morrow and Jansen at the back end, and with the Dodgers having plenty of reinforcements to get them there in Tony Watson, Tony Cingrani, Josh Fields, and Kenta Maeda, this one isn’t close. Edge: Dodgers. The Astros played stellar defense, with huge plays seemingly keying all of their ALCS wins. The Dodgers are a stout defensive club as well, especially with Yasiel Puig’s rocket arm in right field. But a slight nod to the Junior Circuit club here. Edge: Astros. For whatever reason, the team that comes in with less rest always does better in the World Series. At least that’s been the case in the last eight years, as every team with less rest since 2008 has gone on to win it all. The layoff shouldn’t be a big factor, but you never know. The fact that the Astros had to rally to beat the Yankees bodes well for them, and they also had to rally late in Game 4 of the ALDS at Fenway Park to close out the Red Sox. L.A. has had things pretty easy in terms of wins and losses, dropping only one decision through two rounds. Only two teams in the wild card era have ever gone an entire postseason losing just one game, so don’t expect a sweep. If the Astros can take one of the first two on the road, things will swing in their favor heading home for the next three. The #HoustonStrong mantra is a driving force for this club the way Boston Strong was in 2013, and the Astros appear to be slightly more battled-tested coming into this series. Edge: Astros. It seems like the Dodgers are the “obvious” choice. In the first Fall Classic since 1970 to feature two 100-win teams, it’s the Dodgers who were the cream of the crop with 104 wins despite a 1-16 stretch at one point. But if there is one team that feels like the team of destiny, it’s the Astros, having dealt with a natural disaster in their city and on the field having to rally to beat the Yankees the way they rallied in Game 4 of the ALDS to beat the Red Sox. On paper, the Dodgers have more depth and the bullpens are mismatched, but the Astros seem to be able to find a way when they aren’t supposed to. I’m bucking conventional wisdom here, not to mention my own preseason pick. Prediction: Astros in 6. Be the first to comment on "2017 World Series Preview: From Coast to Coast, A Sigh of Relief After Astros Take Down Evil Empires"